Horizontal BPO involves function centric outsourcing. The vendor specialises in carrying out particular functions across different industry domains. Examples of horizontal BPO are outsourcing in procurement, payroll processing, HR, facilities management and similar functions. getsix® focuses on providing services in horizontal functions such as payroll, HR, benefit administration, tax solutions, etc. However, according to Gartner, companies should focus on providing vertical services as the market matures. 2. Vertical BPO: A vertical BPO focuses on proving various functional services in a limited number of industry domains. Healthcare, financial services, manufacturing and retail are examples of vertical BPO domains. 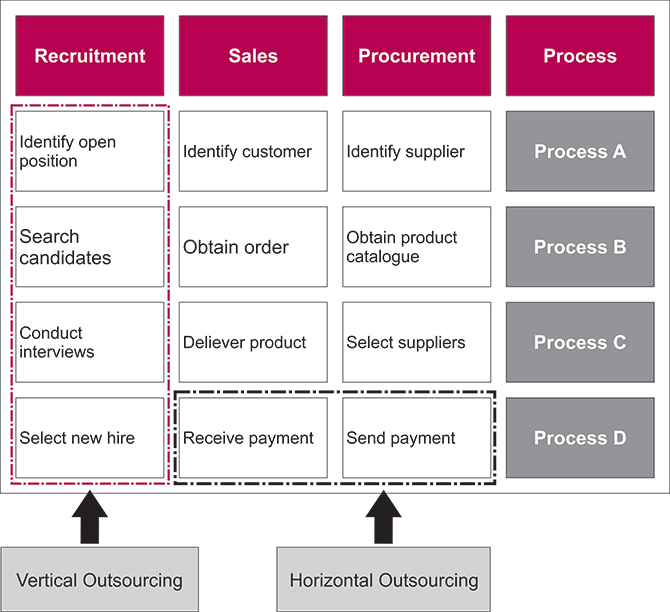 BPO horizontals are function-specific and could spread across different industry domains. Our Business Process Outsourcing Solutions: http://getsix.eu/our-solutions/scope-of-services/business-process-outsourcing/ are examples of horizontal BPO. Vertical BPO concentrates on functional services in specific industry domains such as manufacturing, retail, financial services and healthcare. Our Industry Specific Solutions: http://getsix.eu/our-solutions/scope-of-services/industry-specific-vertical-process-solutions/ are examples of vertical BPO.